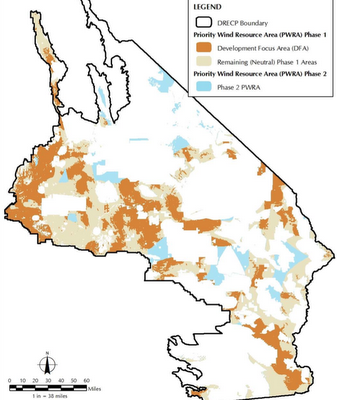 The Los Angeles Times today published an editorial sympathizing with the California Wind Energy Association (CalWEA) regarding the relative lack of development zones suitable for wind energy in California's desert. 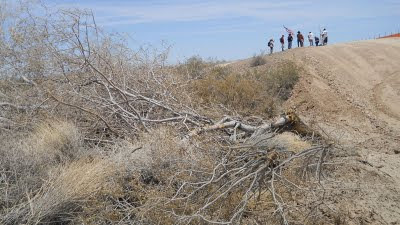 CalWEA believes the planning process for the Desert Renewable Energy Conservation Plan (DRECP) - which will identify areas where land management and wildlife officials believe utility-scale renewable energy development is appropriate in the California Desert District - favors solar over wind. 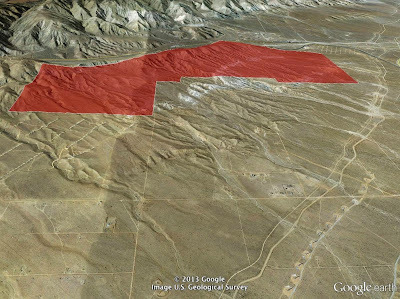 The Obama administration published the Record of Decision on Friday that permits Terra-Gen Power LLC to industrialize more of the western Mojave Desert with the Alta East Wind project, and kill at least one endangered California condor without penalty. The American Bird Conservancy is asking the Obama administration to reverse the unprecedented move to allow the condor death, noting that many private and non-profit groups investing resources in the bird's recovery were blindsided. Update: I have heard that the authorization to allow Terra-Gen to kill California condors may not be under an "incidental take permit," but some other allowance under the Endangered Species Act. Either way, the green light to kill California condors is a significant step in how we protect and recover this endangered species. When more details are available I will write a follow-up post. After flipping through the pages of the Sierra Club's latest issue of Sierra magazine, I am left with a deep disappointment as the organization -- of which I am a member -- continues to sound more like an industry lobby group than a conservation organization. Much of the March/April issue is dedicated to exulting the wind industry, with less than a page of material that provides a weak description of the industry's impact on wildlife and wildlands, describing the death of birds and bats by wind turbines as "trivial," and placing a lot of optimistic emphasis on the industry's ability to self-regulate. As another blogger put it, "Not From The Onion: Sierra Magazine’s All-Wind Issue." The Production Tax Credit (PTC) -- a 2.2 cent per kilowatt-hour (kWh) credit for wind energy corporations -- is set to expire at the end of 2012, and a bevy of corporations and environmental organizations are calling on Congress to renew it immediately. The tax break costs $1 billion dollars a year, which is much smaller than the subsidies Congress is giving to the fossil fuel industry, but has still drawn opposition from Congress and, of course, the fossil fuel industry. 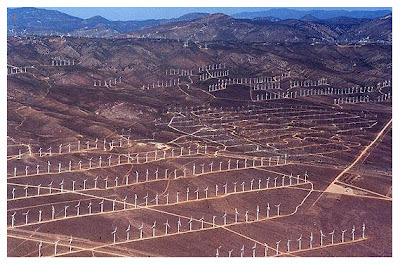 The Alta Wind Energy Centercontinues to consume and industrialize dozens of square miles of desert habitat in the western Mojave Desert. The total project area already encompasses over 50 square miles -- nearly 1.5 times the size of Manhattan -- and continues to expand. 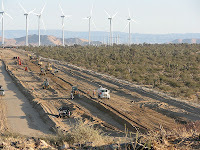 Hundreds of wind turbines -- each over 420 feet tall -- require new roads and pads carved into desert soil to supply Southern California Edison (SCE) customers with "guilt free" wind energy. 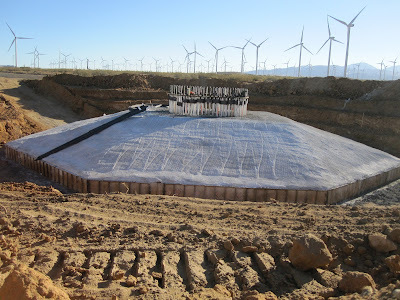 Don't tell SCE customers that wind turbines require immense amounts of cement, steel and copper to deliver that energy to them, not to mention natural gas "peaker" plants running in the background. Meanwhile, a UCLA study found that Los Angeles County could meet much of its energy demands with solar panels on rooftops or over parking lots. It's an odd situation when the Sierra Club provides unconditional support to an industry that describes wildlife and conservation goals as "obstacles," lobbies to weaken the environmental laws we have fought hard to institute and enforce, and enjoys comfortable access to a White House promoting an "all of the above" energy policy that is taking its toll on our climate and our public lands. In a blog post titled "Americans Agree With President Obama: Wind Is the Way," Sierra Club Director of Clean Energy Dave Hamilton calls for the renewal of the Production Tax Credit (PTC) that has driven the wind industry's expansion onto wildlands in recent years, yet the wind industry simultaneously ignores the Club's conservation concerns and dismisses guidance from the US Fish and Wildlife Service (USFWS) to avoid impacts on protected and endangered bats and birds. Wind energy destroys land, kills birds and bats, and requires immense amounts of steel and concrete, both of which are intense polluters. And because wind energy is so intermittent -- an unreliable source of power -- utility companies have to contract with natural gas "peaker" plants to generate energy during the times when the wind is not blowing. This means that wind energy is not an efficient means of cutting carbon emissions. There is no free lunch when it comes to energy, but we do not have to keep ordering from the same menu. Invest in rooftop solar and energy efficiency, and we can sharply reduce our demand for destructive energy sources like coal, and natural gas, and wind. Wind energy is not the answer. It is another corporate juggernaut with an insatiable appetite for our natural resources. Wake up, environmental community. Energy efficiency, and rooftop solar is where are efforts should be focused if we are going to defeat coal without regrets. The Sierra Club informed the Department of Interior in January that it supports mandatory guidelines for the wind energy industry that would protect wildlife, strengthening its previously expressed position that only favored voluntary guidelines, according to the March issue of the Desert Report. The move is a positive sign that the Sierra Club hopefully recognizes that we can no longer turn a blind eye to the destructive potential of any energy source -- whether that is coal, natural gas, wind or solar -- and that the conservation community should protect our natural resources instead of facilitating their destruction for the benefit of corporate profit. The Sierra Club's letter follows a petition submitted by the American Bird Conservancy in December asking Washington to establish a mandatory permitting system that will hold the wind energy industry accountable to environmental law. The American Bird Conservancy (ABC) formally petitioned the Department of Interior to establish and enforce a permit mechanism that would regulate the wind energy industry's impacts on birds. 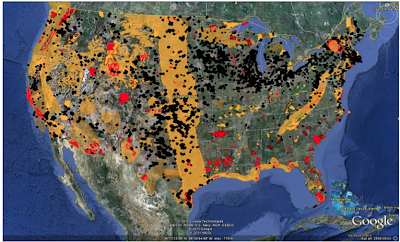 The petition provides insight into a cavalier energy industry that has shown little regard for wildlife conservation, and Federal agencies ignoring their responsibilities under two major laws -- the Migratory Bird Treaty Act and Bald and Golden Eagle Protection Acts. Without regulation, the wind energy industry will push already-imperiled birds and bats into further decline, including the Golden Eagle, Peregrine Falcon, Whooping Crane, Cerulean Warbler, Hawaiian Goose, and California Condor. Our efforts to cut greenhouse gas emissions should not involve such widespread destruction of natural resources. The departure of the Sierra Club's chairman -- Carl Pope -- comes during a dark moment for environmentalism. The vanguards of the green movement have compromised their core conservation ethic, forging alliances with corporations and ignoring the grassroots in order to make way for an unchecked renewable energy industry that is more intent on destroying public lands than saving them.